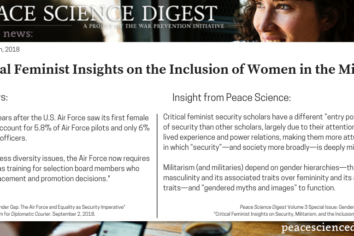 The following analysis is from Volume 3, Issue 6 of the Peace Science Digest Citation: Bastick, M., & Duncanson, C.
Militarism, warfare, and the military itself all depend on gender hierarchies—the privileging of masculinity and its associated traits over femininity and its associated traits—to function. 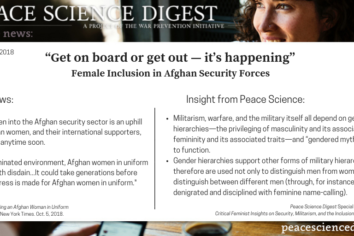 Women in Afghanistan are especially aware of this of sexism and inequality as they seek to join their country's military and police force. Its been over a year since a major US news network has mentioned any U.S. participation in the Yemen war. 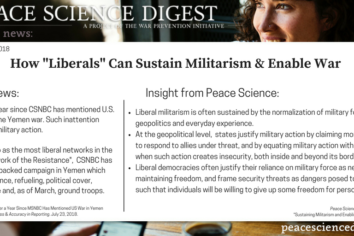 Such inattention normalizes U.S. military action and contributes to the greater indifference to militarism throughout U.S. society.